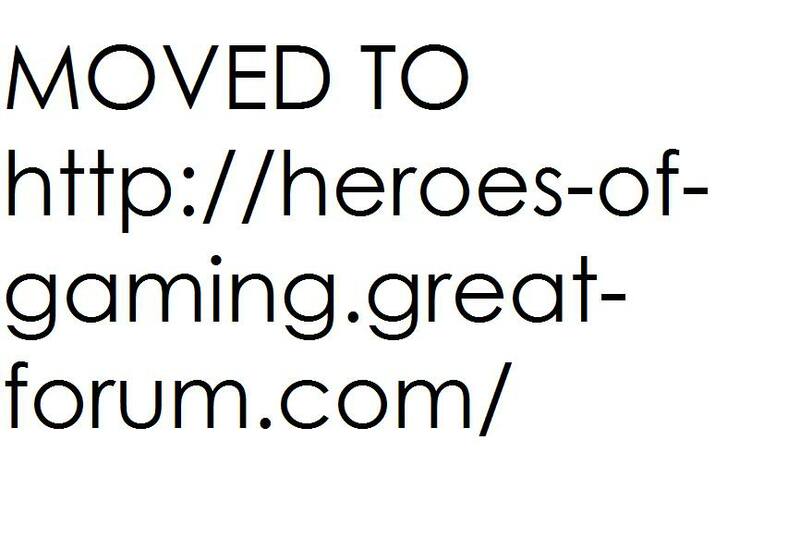 MOVED TO: http://heroes-of-gaming.great-forum.com/ » News Area » News » Official return plus changes. Right I am back from my Olympic stage debut and now I will once again be leading HoR in full activity. From when I last came on AoM had severe sync issues so I reinstalled it.... or at least tried to. HoRG group created for our new HoRG rank. Admin rank created as to allow Advisory Board members access to the admin panel. EDIT: just discovered moving members over to a new forum is impossible, as is moving topics, we are stuck with what we have so all important topics will have to be copied over, the move shall begin as of Saturday. About the information not being transferred, is that what they said at forumotion? I will be around on Saturday so I can help with copying over and admistrative stuff so you don't have to take care of everything. I think there is a way to copy over comments and topics manually. Might have something to do with HTML codes because you can "search elements" with Firefox. I would like to be administrator on here mainly so I can contact all the HoRs and write a global announcement about the new forum and being able to copy topics if possible. Glad to have you back. How did your preformance go? HoRC_Lord_Yankee wrote: About the information not being transferred, is that what they said at forumotion? Its a distinguishable colour, as its not taken by any other colour, all members instantly join a group on here anyway. I have some sad news to bear. Torrent = different game version, and besides, it still uses an installer and would still cause my files to crash? Don't know until you try. Cracked games... come to the dark side! We have cookies! I already have a torrent installed so I could play my friend over AoM, I technically have a legal and pirated version of the same game - pirated versions do not work unless you want to play me over gameranger, in which case we would all have to pirate. I have gameranger, why I would I have to pirate the game to play it on there? HoRC_Lord_Yankee wrote: I have gameranger, why I would I have to pirate the game to play it on there? If you dont have the legal version, then you can't play with pirated users, now I guess I am forced into pirating until I get a new computer/fix this computer as I cannot actually use my legal copy, maybe I will go round a friends and try installing on theirs and copying all the files to USBs and reassembling on my computer? If I get all the files right I should be capable of playing again. You could always buy a new disc from amazon or whatever. They cost like 10£. I got the Ubisoft exclusive: Gold Edition disc. However, from what I have heard, you can't get online with that one. I was not able to test because my old Gold Edition disc worked again. Now I have a back-up copy. You cant get online because they are copied Product Key's. If you have a product key in the one you use anyway, it should still work with the new disk. HoR_King_Hades wrote: the move shall begin as of Saturday. I will be out until Sunday afternoon. I will join you guys for the move when I get back. If there is a way to copy comments and topics etc., I really think it would be worth trying. 17 Re: Official return plus changes.